After an era of reproducing Western patterns, Polish architecture seems to be going its own way. Original and successful projects are becoming more and more numerous. 1989 was a very important turning point since, along with the system change, began to appear structures which up to now had only been seen in the West, and had never existed on the banks of the Vistula. Glass office buildings, private (and fenced) apartment houses, but also supermarkets, multiplex cinemas, fast food stands or shopping centers became symbols of capitalism, of a new lifestyle, as well as the embodiment of aspirations, a remedy to national complexes. In the 90s the architecture market was reshaped after 50 years of nationalization, and as a result architectural design studios became private, thus submitted to the rules of the free market. The craze for young capitalism is visible in the architecture of the 90s, created in a rush, haphazardly, chaotically. Some buildings which a few years ago were considered ultramodern have already been demolished, and a few others are about to. The new millennium has brought a certain stabilization to trends in Polish architecture. Controversies do occur - the policies of developers are outside the control of local authorities, which results in huge office buildings or housing communities without basic infrastructure being built over even the smallest plots of lands. Today, next to densely populated new block communities, more successful structures are built – e.g. the Wrocław Corte Verona community built in zigzag shapes (designed by Zbigniew Maćków), or the Warsaw 19th District (design JEMS Architekci). When it comes to multifamily housing, simple, geometrical, modernist forms are still popular; as can be witnessed in the Bażantów community in Katowice - here a group of studios owned by J.W. Małecki created Enklaw Modernistyczny, a housing complex which alludes directly to prewar Bauhaus modernism. 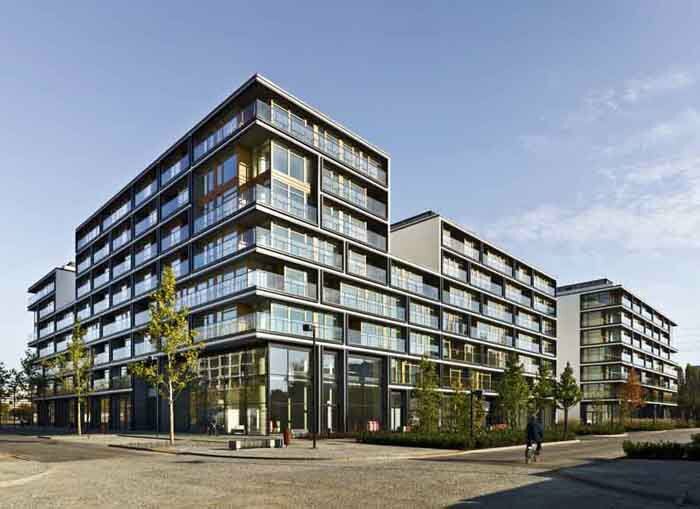 The Silesian Medusa Group very skillfully adapts industrial structures for housing. In Warsaw, Jakub Wacławek and Grzegorz Stiasny build simple yet stylish metropolitan housing complexes, and in Wrocław Zbigniew Maków successfully composes new buildings into antique surroundings (e.g. the beautiful apartment house ‘Thespian’). Most importantly, these new buildings are no longer fenced in and under surveillance, an indication that times are changing. Along with the influx of European Union funding a real construction boom can be observed in colleges and universities, where practically all of them gained some new buildings. The most famous one is the award-winning 2011 Center for Scientific Information and Academic Library- a common investment of the Economical and Silesian Universities in Katowice. Coated in russet stone, the cube-shaped construction is the work of Dariusz Herman, Piotr Mierzewski and Wojciech Subalski from the HS99 office in Koszalin. In Białystok, the Center for Modern Education of the Białystok Institute of Technology was inpired by folk patterns (designed by aa_studio, Adrian Staszczyszyn, Sebastian Bieganowski), and in Wrocław the New Academy of Arts building was designed almost completely of glass (design Tomasz Głowacki). The Resovia University Center for Innovation and Technological Knowlegde Transfer features an oval assembly hall hanging over the lobby (designed by Edward Lach and his team). In Warsaw, in the middle of the old University of Technology complex, a new glass building was erected for the Institute of Mathematics and Information Sciences (design Dedeco). Jerzy Gurawski, author of the plans for the Poznań university campus in Morasko, still makes plans new designs. The new 'siege' of the Institute of Information Technologies at the Marie Curie University in Lublin has a tower lit up with multiple colors. The Warsaw 'JEMS Architekci' office created a minimalist wing to the already existing 19th century headquarters of the Raczyński Library. The 'KKM Kozie Architekci' group created a new circular building for the Wrocław Theater School – covered with gold-colored tiles. The company founded by the tragically deceased Stefan Kuryłowicz builds futuristic objects at the Warsaw University campus in Ochota, and they also designed a colorful and friendly looking Linguistics Institute in Powiśle. Also thanks to Union Funding, all over Poland constructions that serve cultural purposes are built. One of the most interesting among them is the Podlaska Opera and Philharmonic in Białystok, built according to Marek Budzyński’s design – here the concert hall is hidden in a steel silo which is entered through a monumental colonnade entwined with green patterns. In 2004, Romuald Loegler designed the Łódź Philharmonic building, and four years later the Kraków Opera house (the latter, however, received negative feedback for not befitting the city). Also in Kraków, Pysall Ruge Architekten and Bartłomiej Kisielewski designed the spectacular Polish Aviation Museum, which resembles an enormous concrete propeller. The Contemporary Art Museum in Wrocław is still awaiting construction – the design by Mirosław Nizio is shaped like a black box. The Contemporary Art Museum in Kraków received the buildings of the former Oskar Schindler factory (the buildings have been adapted for museum purposes by Claudio Nardi). Among the several picturesque Warsaw museums (Museum of Modern Art, Museum of Polish History), so far it is the Museum of the History of Polish Jews, a glass structure with a curved hall designed by Finnish architect Reiner Mahlamki, which is generally proclaimed as one of the most beautiful buildings in Warsaw. For a long time, the glass towers of office buildings have been proof that Poland has become a capitalist country. However, they have become commonplace, and the new trend is to build original sieges for companies, which can also become trademarks of a given company. The famous Okrąglak in Poznań, a masterpiece of 20th century modernism, has been adapted for office purposes (designed by Marek Leykam). The Skalski company in Kraków erected a building in the shape of a rainbow (design Romuald Loegler). 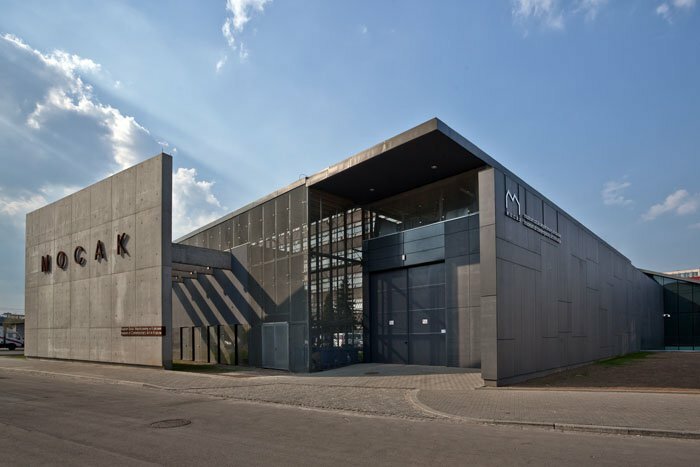 The new siege of the board of the Lubelski Węgiel company in Bogdanka resembles a shiny lump of coal glistening in the sun (design Piotr Buśko and Walenty Wróbel). The office building of Rdl & Partner in Gliwice (design Medusa Group) also features black facades. In the suburbs of Kraków, the Yeti advertising agency has a private and secluded office which resembles a semi-transparent lantern (design Group_A_Architects). Nearby the Chopin Airport, Stefan Kuryłowicz erected an ultramodern glass office for Polish LOT Airlines. For a couple of years, the trend has been to build well designed shopping arcades in city centers instead of the former sheet metal stands where individual sellers used to be. Galeria Korona in Kielce (design Bose International Planning & Architecture) features two oval wings decorated with lace patterns. 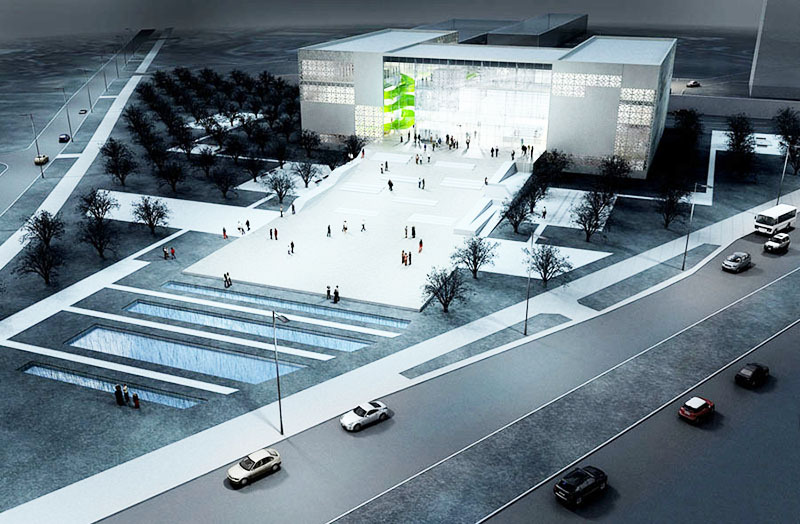 In Olsztyn, Galeria Warmińska is built according to the design of Kuryłowicz & Associates – its unique alveolar design make it instantly recognizable; it also features a spacious public amphitheater and a recreation court. 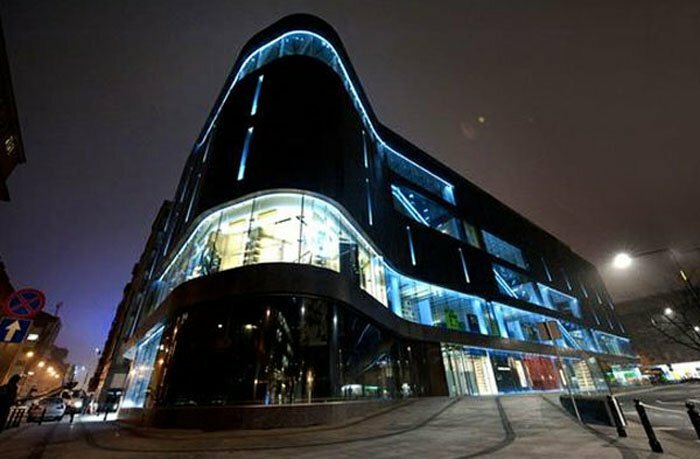 The same studio designed one of the most controversial buildings in Warsaw: the VitkAc Galeria – its black stone façade add an intricate, dense and uncompromising structure to the busy street on which it is located. The Galeria Amber in Kalisz features golden elevations which remind the viewer of that the city was once part of the Amber Trail (design Bose International Planning and Architecture incooperation with Artur Jasiński i Wspólnicy). The 2013 Galeria MM in Poznań has raised objections because of its anachronistic, deconstructionist but also very expressive form (design Studio ADS). Along with the improvement of the quality of Polish architecture came a dynamic rise in public interest. This is mainly visible through the creation of more and more awards for both best and worst buildings (usually judged by both professionals and internet users). Some of these awards are nationwide e.g. Bryła and Makabryła of the Year, awarded by the site: bryla.pl; the awards of Polityka weekly; or the competition Life in architecture by the monthly magazine: Architektura-Murator; and others local ones (Katowice, Kraków and Wrocław all have their own locally awarded prizes). Within the last few years a lot of foundations and associations have been formed to promote and educate in this sphere; more and more books are being published, e.g. 90 years after being written, LeCorbusier's architectural treaty has finally been translated into Polish. Filip Springer's collection of reports about the architecture of the People's Republic: 'Born Of The Wrong Parents' has also become a bestseller. 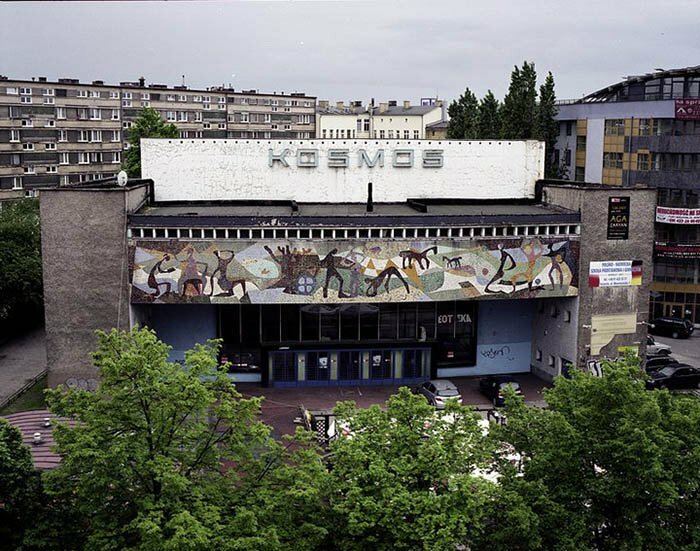 As we have observed Polish architects have stopped copying blindly Western patterns and started designing new, interesting and valuable structures, and the rising enthusiasm for architecture has raised the bar – all this should bring us better buildings in years to come.